There are many divides among Americans when it comes to their views and practices about food, but one of the biggest is the generation gap in attitudes about organic produce and genetically modified foods. Younger adults are more likely than older adults to think organic foods are better for their health and to believe GM foods are worse. About six-in-ten U.S. adults younger than 30 (61%) say that organic produce is better for health than conventionally grown varieties, as do 57% of those ages 30 to 49. In contrast, 45% of seniors (those ages 65 and older) say organic produce is healthier, according to a new Pew Research Center survey. 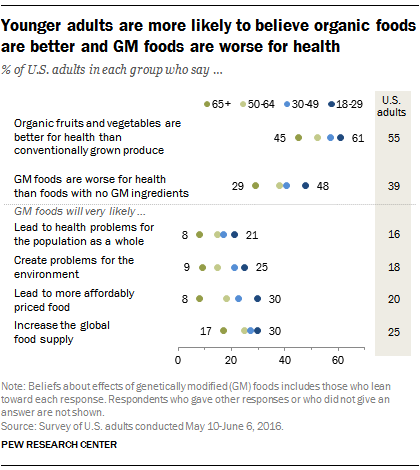 At the same time, younger adults are more inclined to believe that genetically modified (GM) foods are worse for health than non-GM options. Some 48% of those ages 18 to 29 say foods with GM ingredients are worse for one’s health than foods with no GM ingredients. About three-in-ten adults 65 and older (29%) think GM foods are worse for one’s health. Younger adults are also more likely to expect GM foods to lead to harm for the population as a whole. Those ages 18 to 29 are more inclined than those 65 and older to say it is very likely that GM foods will lead to health problems for the population (21% vs. 8%). Younger adults also are more likely than those 65 and older to say GM foods will create problems for the environment (25% vs. 9% of seniors). But adults younger than 30 also are more inclined than those 65 and older to expect positive effects from GM foods: 30% say such foods are very likely to help make food affordable, and the same share says GM foods are very likely to improve the global food supply. There are also at least modest generational differences in eating habits. More younger adults than older ones follow a vegan or vegetarian diet. Some 12% each of those ages 18 to 29 and those 30 to 49 say they follow a vegan or vegetarian diet either strictly or mostly. About half as many adults ages 50 and older say the same (5%). But in other ways, the buying and eating behaviors of younger adults appear similar to their older counterparts. Roughly similar shares of adults younger than 50 (71%) and older than 50 (64%) have bought organic foods at least once in the past month. 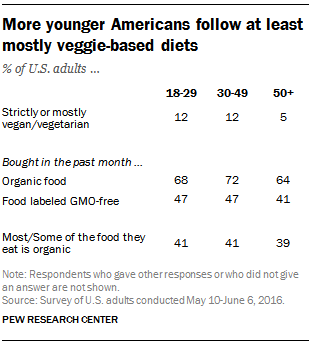 And about four-in-ten of each age group say that most or some of what they eat is organic. Some 47% of those ages 18 to 49 say they have bought food that is labeled GMO-free in the past month, as do 41% of those 50 and older.